This deluxe right side overbed table by Drive Medical serves many purposes. It can be used for eating, writing, crafts, working on the computer, reading, games and much, much more. 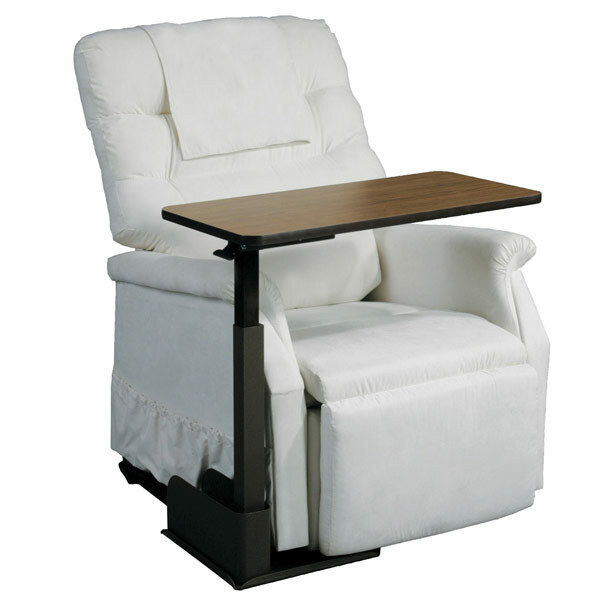 The product was designed for use with a lift chair, standard recliner or couch. The table comes available in right or left positioning with 180 degree rotation, allowing a chair to be placed near any wall. The attractive, teak wood grain laminate finish top is easy to clean and scratch resistant. It pivots 360 degrees at the touch of a hand. A built-in magazine rack provides added storage for your convenience. Furniture weight secures the table in place, so the product requires no attachments. It is protected by a limited lifetime warranty. Designed for use with a lift chair, standard recliner or couch. Can be used for many activities such as eating, writing, crafts, working on the computer, reading and games. Right or left positioning with 180° rotation so that the chair can be placed by any wall. Table top pivots 360° at the touch of a hand. Teak wood grain laminate finish is attractive, easy to clean and scratch resistant. A built-in magazine rack provides added convenience. Requires no attachments. Furniture weight secures table in place. One Year Limited Warranty.